 This Melissa and Doug magnetic letters set contains both upper and lower case letters.  Durable and strong magnets. 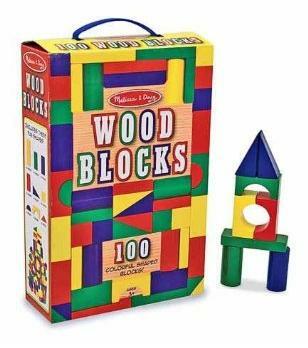 The Melissa and Doug Magnetic Wooden Alphabet (for ages 3 and up) is a set of magnetic letters containing both upper and lowercase letters. The letters are made of wood and the front is painted with a smooth, shiny enamel. The entire back of the letter is magnetic and the magnets are strong so you don't have to worry about the letters falling off. The letters are large, good for younger children and their little hands. And like many of the Melissa & Doug toys, the letters are durable which is not often the case with other magnetic letter sets. Children love playing with magnetic letters on the fridge or dishwasher. Children familiarize themselves with the letters of the alphabet and learn to recognize letters in both upper and lower case. 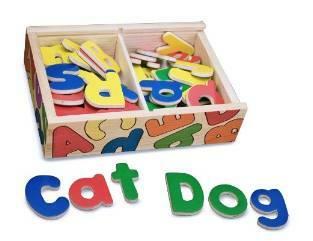 By using the magnetic letters to write their own name or small simple words such as "car" or "cat", they develop reading skills early on.